The notion of space, purity, refined atmosphere and a decisively modern sobriety were considered by Frederick Menchise of Paris while designing HARAMA II. Use of wood throughout, was chosen as a gentle material which represents the perfection of luxury, reminiscent of the English yachts of the 30s. The result reflects a fine example of a unique avant garde design. 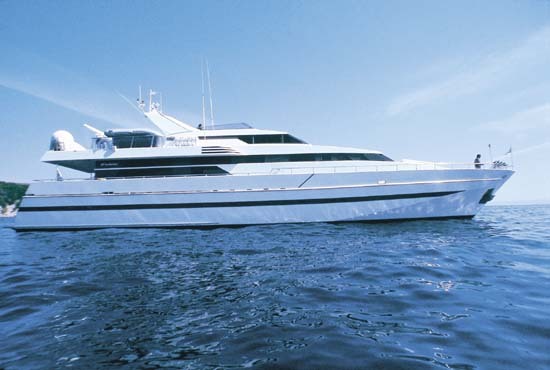 The spacious and fully cushioned foredeck consists of an island of luxury for sun lovers. The upper deck combines ample space for sunbathing in seclusion and an additional al fresco dining area offering panoramic views. The enormous saloon and dining area, which comfortably seats eight guests, is beautifully decorated with refined lacquer furnishings, walls covered with whitened oak, ceilings with white leather, and mirrors which reflect the rays of sun into the blue tint of the Aegean. The saloon incorporates intimate sitting corners, a full service bar, recessing TV, VCR and entertainment center. 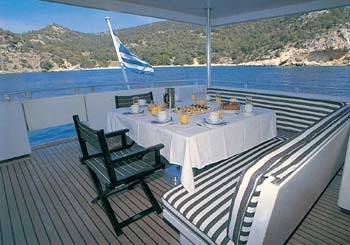 The aft deck is well shaded and spacious, the perfect place for having breakfast, snacks or cocktails. Sea worshippers may descend the stairs leading to the swimming platform. 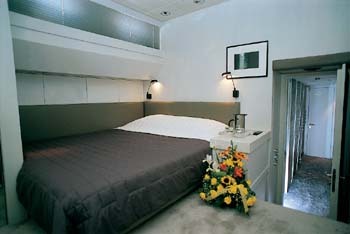 ACCOMMODATION : For 8 guests in four cabins. One VIP cabin on the lower deck. 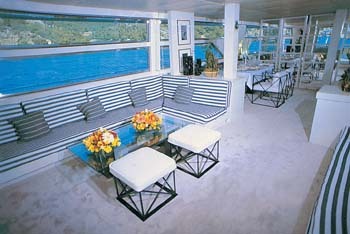 Three double cabins, with queen size beds on the lower deck. One twin cabin on the lower deck. All cabins, with en suite bathrooms and recreational facilities. RECREATION : Boston Whaler 5,18 m with 140 hp Johnson outboard, Load star 3,20 m semi rigid with 9,9 hp Johnson outboard. Full selection of water sports equipment including: fishing, water skiing, pair of tubes, laser sailing boat, wind surfing equipment, surf jet x 1, jet ski x 1, scuba diving gear.